Czechia Review 2019: Is Czechia a Good Hosting? CZECHIA was the Czech Republic’s first specialized hosting service provider, and today is one of its leading providers of internet services. Czech company CZECHIA started out as ZONER software in 1996, and it was the first company in the Czech Republic to have its own .com domain. Since 1997 it has had its own servers based in Brno and Prague in the Czech Republic, on which it hosts more than 150,000 domains. CZECHIA offers professional web hosting services primarily to local Czech customers but also to some global clients. It also offers cloud servers and storage, dedicated servers, domains, SSL certificates, web design, and SEO services. CZECHIA’s website is in the Czech language, but its technical support pages support additional languages such as English, German, and Slovak. CZECHIA’s nine shared hosting plans vary in terms of disk space, number of emails, and supported software. The WordPress and Linux plans provide 4 GB to 100 GB disk space plus 100 to 999 email accounts, and they support MySQL 5.7.x, PHP7, and HTML. The Windows plans come with 32 to 100 GB disk space, 999 email accounts, and support ASP.NET, ASP, MySQL/MS SQL, and HTML. CZECHIA’s Linux and Linux PLUS programs are designed to run PrestaShop, Magento, Joomla, Zen Cart, osCommerce, and OpenCart, so you can easily implement an online store. You can also easily create discussion forums (with phpBB, UseBB, or Vanilla) or a photo gallery. This provider offers various free hosting options that include its InPage MINI content editorial system, or which allow you to test PHP5 or ASP2 applications before signing up for a paid plan. 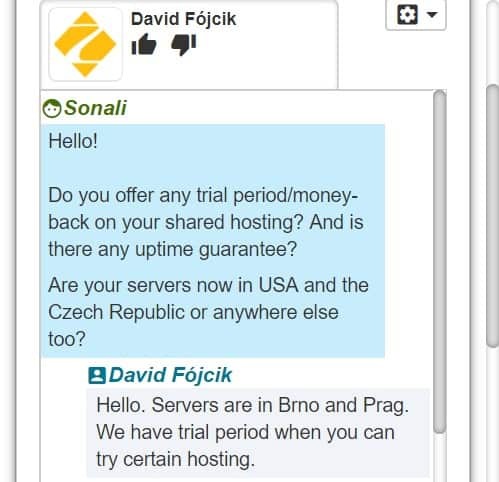 CZECHIA’s servers are located in its own data centers that use a high-quality ISP to connect to the internet, so it can offer 99.99% guaranteed availability. CZECHIA’s shared hosting plans are competitively priced, but you need to add the 21% VAT charge to the displayed prices. You can pay for plans in Czech koruna by bank transfer or credit cards, and you can easily change your plan by sending an email to the admin office. Sign-up incentives include a 15% discount on annual plans and three months’ free hosting when you switch from another provider (if you submit your most recent invoice). You can contact CZECHIA’s 24/7 support staff by phone, email, online chat, or an online contact form. I twice tried the online chat (inside and outside of office hours), and I found them to be extremely responsive on both occasions. For self-help, CZECHIA provides a well-populated technical support portal (knowledge base) that includes video tutorials. For high-quality, feature-packed Czech hosting, CZECHIA could be your go-to provider. However, its plans are probably more suited to experienced webmasters rather than absolute beginners. Purchase one of CZECHIA’s plans for powerful Czech hosting. Wondering how Czechia stacks up against other Web Hosting companies? Enter any other Web Hosting company and we will give you a side-by-side comparison.